The 30-Day Challenge takes readers through thirty practical father-daughter activities, meant to strengthen dads in their parenting roles, while also creating honest and thriving relationships. With twenty-five years experience as a pediatrician, Dr. Meeker combines her expertise and wisdom with warmth and humor to make this the perfect guide for dads to take the Strong Fathers, Strong Daughters experience to the next level. Reflection questions help readers examine where they are as a dad right now and where they would like to be this time next year. Checklists with important reminders help the reader commit to following through and adequately preparing for the challenges. Challenges can be adapted from the simple to the involved, depending on time availability, comfort levels, and the daughter's age. Unlike other parenting how-to books, The 30-Day Challenge becomes a cherished handbook as dads and their girls evolve in their father and daughter roles. The 30-Day Challenge will equip dads to answer the call to become engaged and intentional fathers. "Both my girls were practically grown and gone the first time I discovered Meg Meeker s Strong Fathers, Strong Daughters, but it still had a huge impact on how I talk to and relate with them. Strong Fathers, Strong Daughters: The 30-Day Challenge is the book I wish someone had given me the day my first daughter was born!" "Meg Meeker radically changed the way I look at parenting and fatherhood. There is joy, wisdom, and truth in everything she writes, and I will be the first in line to buy each new book she shares with the world." "Raising four daughters while playing professional football was very demanding. Dr. Meeker is oh-so-accurate when she points out just how observant and impressionable young girls can be! Her work always inspires me to do a better job, and The 30-Day Challenge is filled with lots of good ideas. Thanks, Meg!" "Dads need help, particularly when it comes to building bonds with their daughters. Dr. Meeker's wise, practical book offers fathers activities they can do today to establish a relationship with their daughters that will extend far into the future. 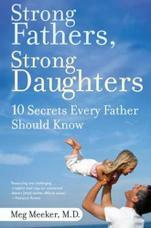 Get this book now and spare your family and your daughter the mistakes that so many men have made in the past."